Concord West, a suburb in Sydney’s inner west, like many Australian locales, is susceptible to the extreme temperatures this country’s climate brings. The Concord West Shopping Village on Victoria Avenue is particularly vulnerable to the heat of the summer months as the road runs east to west and, as a consequence, is in full sun throughout the day. This is exacerbated by the urban heat island effect, which basically means an urban or metropolitan area is warmer than its surrounding rural areas due to human activities. City of Canada Bay, the local government body that encompasses Concord West, was well aware of the extreme temperatures in the shopping strip and the impact it had on its patronage. It found that the high temperatures meant that the shops required significant shading. The peak business time from 12 noon to 2pm was also the hottest, putting the community off going to the local shopping strip during its busiest period. With the road pavement running through the shopping village up for renewal, the council saw an opportunity to undertake a project that addressed this issue while also capturing the interest of the community. John Earls, Manager City Assets at City of Canada Bay, was invited to a white asphalt trial in Sydney. “Myself, Darren Prosser from Downer and Ken Halstead, Head of Local Government Studies at the University of Technology Sydney (UTS), attended the trial in the city’s redeveloped industrial district,” says Mr. Earls. This white asphalt trial, undertaken by the City of Sydney on Myrtle Street in Chippendale, was intended to cool the area. White asphalt is an open graded asphalt with rubberised cement, which is vibrated and screeded to fill the voids achieved by the single-sized aggregate. Downer produced its own white asphalt, called Ascrete, which was used in the trial. The product was previously used in harder wearing surfaces where it was not practical to lay a full concrete pavement, such as pavements that experience lots of turning movements, dripping oils and fuels. City of Canada Bay partnered with Downer on a project utilising this concept, which aimed to not just fix the road but also change the social fabric of the Concord West Shopping Village. Downer’s Ascrete was chosen for a particular stretch of Victoria Avenue on the shopping strip with the aim to help reduce the heat island effect on the area, in turn affecting how and when the community used the local shopping village. In addition to the white asphalt developed by Downer, the council wanted to apply other road renewal treatments to the pavement, including higher reclaimed asphalt pavement (RAP) content pavement, warm mix asphalt and Downer’s TonerPave product. “The cooling concept is fantastic, but if we just went out there and put this white asphalt road in no one would know or appreciate it,” says Mr. Earls. He explains that a major problem from both a local government and industry perspective is that the community often isn’t able to understand the significance of what it does; individuals see a road as just a road. City of Canada Bay wanted to take a placemaking approach with Concord West Shopping Village and engage with the community at a deeper level so that they understood and ultimately supported the works. The cross department team undertook a number of marketing activities before any physical work commenced. “A month before we did the work, we had marketing pop-up stores. This included things like a ‘cycle up your own smoothie’ stand, which was just a novelty to capture the interest of the people,” says Mr. Earls. The team also prepared a project fact sheet, undertook door knocking of businesses, post card distribution to residents and ran an information market stall afternoon. 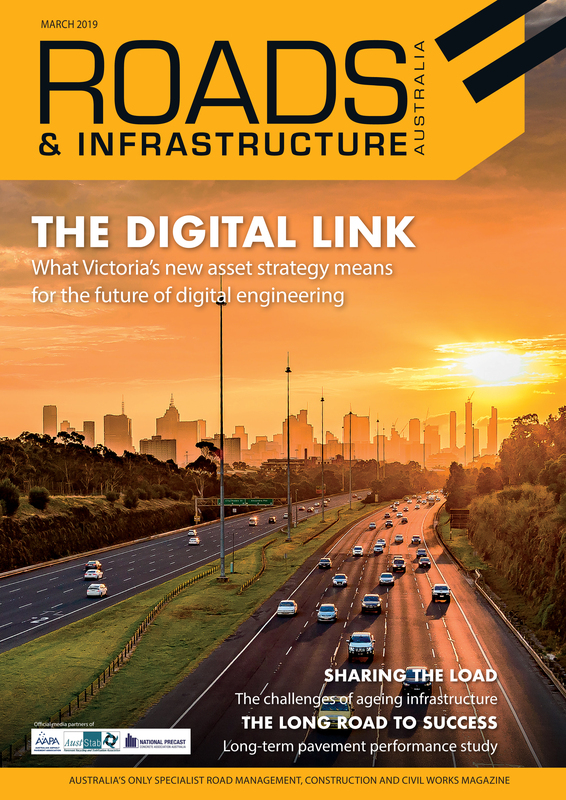 In addition to a strong marketing approach, the project sought to create an opportunity for an engineering student from the UTS Local Government Centre of Excellence to be a part of the process and use it as their Capstone project. The student was tasked with creating a project plan, temperature monitoring, place activity surveys, provide an on-street information hub and interact and discuss the project with shoppers and businesses. “It’s about being sustainable and relaying to industry and the community that we need to give student engineers these kinds of opportunities. If we just do it without training and educating younger engineers, there will be no one to pass on these expertise and experiences to,” Mr. Earls says. The cooling effects of the white asphalt were used as a major marketing focus during this process as it helped capture the interest of the local community. The place activation survey looked at what people in the community were doing at the shopping village and how long they were staying for. Mr. Earls says a major sustainable aspect of the project is to encourage the community to use the shopping village space, but also to connect with each other by walking to and from the shops together. Rather than heading to the large, air-conditioned shopping centres, Mr. Earls says the project aimed to get the community to use its local shops and businesses and create community ownership and belonging. He says a better understanding on all ends was achieved by this holistic, cross-departmental team approach. The community, for instance, was able to understand the value of using different road renewal treatments by ensuring that all parked cars were removed from the street and there were no complaints received during the works, which Mr. Earls says can be the norm on pavement projects such as this. Pavement construction was completed over two days, including one night shift, in November 2015. Ascrete was laid in the commercial section of the village, while Downer’s TonerPave, warm mix and high RAP asphalt were used elsewhere on Victoria Avenue. While the council recognised that traditional concrete pavements would be slightly cooler than white asphalt, it opted for asphalt because the capital cost of installing a concrete road is considerably more than an asphalt road. The longer construction and curing times were also factors the council took into account when recognising what disruptions the work may cause the community and shopping area. Downer’s TonerPave asphalt, which utilises recycled toner from printer and photocopier cartridges, was another sustainable measure employed on the project. Previously residual toner left in the cartridges was sent to landfill, but TonerPave gives it new life in road pavements. The toner from 8000 used toner cartridges was recycled for use on Victoria Avenue, which represents 20 per cent of printer and photocopier consumption in Canada Bay. The use of warm mix allowed the contractor to produce its asphalt at significantly lower temperatures (130 degrees Celsius), compared to conventional hot mix asphalt (180 degrees Celsius). This mix also used up to 30 per cent RAP to replace both virgin aggregates and new bitumen. The combination of warm mix, up to 30 per cent RAP and recycled toner resulted in a suitable, and sustainable, pavement solution for the project. Mr. Earls says the use of RAP also helped promote to the community the value in reducing demand for virgin resources. All road pavement materials milled from Victoria Avenue were reused in accordance with the EPA’s Road Making Materials Reuse Exemption to renew a local car park. The contractor also applied a spray application of bitumen emulsion with fillers and sand to stop the deterioration of the aged/oxidised bitumen of asphalt wearing course to another section of Victoria Avenue. While Mr. Earls asserts that the 2016/17 summer period will most likely be the best indicator as to the impact of the project and its social implications, the council has already seen the benefits of the pavement treatment on the area’s heat island effect. “We found that the white asphalt delayed the peak heat period. It was being recorded at 2pm rather than 1pm because the white surface reflects a lot more heat and takes longer to warm up,” he says. “This is a good thing because it supports the usage of the shopping centre. Saving just a couple of degrees in temperature makes a big difference. “We also found that the white asphalt reduces ambient temperatures by 2 degrees, so it’s quite a good fit for the use of this area. Mr. Earls says using not just the white asphalt, but different road pavement treatments, such as high RAP and TonerPave, have been great proof of concepts for local councils when it comes to creating sustainable roads and communities. The outcomes of the project have also been recognised by industry. For its part in the project, Downer was awarded the 2016 Australian Asphalt Pavement Association (AAPA) New South Wales Award for Innovation, and subsequently the National Award for Innovation at the association’s national awards ceremony in September. The award was given for Downer’s innovative set of pavement treatments, completed in conjunction with the council’s proactive approach to sustainability. For Downer Executive General Manager – Road Services Dante Cremasco, the Concord West Shopping Village project represents the company’s dedication to innovation and the benefits of employing a strong collaborative approach with customers. “Under the guidance of Darren Prosser, the team recognised that the client had a unique sort of situation in that particular area and worked out a way to include the right pavement technology applications,” says Mr. Cremasco. Mr. Cremasco says the project is a good case study that clearly shows the benefits of personalising multiple pavement applications and concepts for the project. Mr. Cremasco explains that the effect of the Ascrete on the area’s ambient temperature was just one aspect of that particular pavement technology that worked well within the overall project. The use of Downer’s TonerPave product, RAP and other green-minded means helped add to the area in its own sustainable way. He says the public is beginning to see the environmentally minded concepts behind road projects such as the Concord West Sustainable Village. Mr. Cremasco says the recognition from the industry for the project, particularly through the AAPA award, is a testament to the pavement team and its efforts throughout the project. “The guys have put in a lot and are proud of what they’re achieving – they do this kind of work to make a difference in our communities,” he says.